Writing my last post about breakfast got me thinking about some of my favorite non-fast breakfast foods. Things that I like to make on weekends when I have time to prep and people to cook for, and nothing but laziness and puttering planned for the day. Sweet breakfasts are not usually my jam- I’m all about the eggs with a side of carbs and a topping of cheese, and I’ve recently been loving the ease of baking my eggs. Baked eggs are so versatile, whether you’re cracking eggs into a vegetable hash, a sauce or making a frittata, it allows you to be more hands off with your cooking, which is especially important if you want to spend more time with your guests (and a mimosa! ), and less time hovering over a pan on the stovetop. This recipe is also quite personal for me. My first real memory of cooking is from when I was 6 year old, when I received “The Little Chefs” UNICEF cookbook, a collection of child friendly recipes curated from around the world. I remember being so excited to start making all the delicious looking pictures in the book, so me and my brother could make a feast for our parents. Shakshouka was one of the first recipes we made, and I’m sad to say it was not a winner- it was more soupy scrambled tomato eggs than baked eggs in sauce. I believe my parents ate enough to make us happy and then snuck the rest into the trash once we went to bed! Although my first attempt at cooking didn’t go as well as planned, that book sparked a love of food and cooking that I carry with me today. 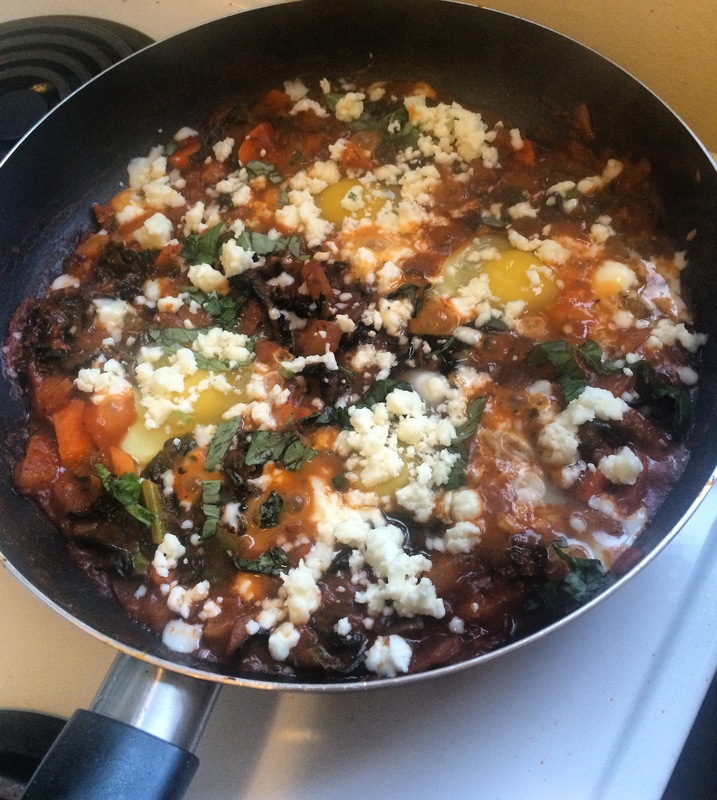 Since then, I have made versions of Shakshouka to much greater success, and this recipe is a baked riff on the traditional stovetop version of the dish. This shakshiuka makes an excellent brunch dish, or if you are like me, an even better breakfast for dinner dish. Serve alongside some good crusty bread and a salad for a complete meal. In a large, deep skillet, heat oil over medium-high heat. The skillet should be big enough to fit 8 eggs comfortably. Add onions, garlic and peppers and cook until softened and beginning to brown. Add tomatoes, vegetable broth or water, cumin, paprika, oregano, mint and salt and pepper; simmer until thickened, around 20 to 25 minutes. Using the back of a wooden spoon, create small nests in the sauce. Crack eggs evenly into these nests; cover pan and cook for 6 to 8 minutes or until whites are set and yolks are thick but runny (if you like firmer yolks, cook for 1 to 2 minutes more). Sprinkle with fresh herbs and feta cheese and serve with bread.